➢➢ “When Jodie Whittaker was announced as the 13th Doctor and the first female occupant of the Tardis, many fans raised their ire on social media, saying that the series was now ruined, that the Doctor should be a Time Lord, not a Time Lady. Having seen the first episode of this new series, it’s obvious that this vocal minority are wrong. Whittaker is a breath of fresh air: a talented, emotionally engaged actress who brings warmth and humanity to a show that was largely in danger of disappearing up its own black hole.” — The Telegraph. 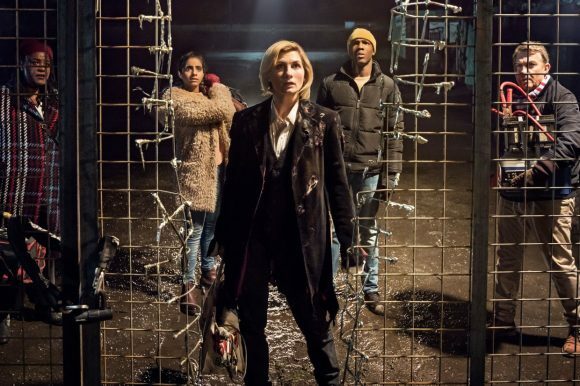 ➢➢ “Now, after over a year of build-up (or at least the 9-10 months since Whittaker first appeared in the 2017 Christmas special) we’re finally getting to see what sort of show Doctor Who is choosing to be this time around – and based on the first episode, it’s a show that’s both easy to recognise as the Doctor Who we know and love and the fresh new take on the formula that’s been sorely needed.” — Radio Times. ➢➢ “This Doctor Who feels like a lot of other TV shows, not just in its writing but in its pacing, its cinematography, its use of music. When the scary monsters appear, you could be watching any other well-made but conventional science-fiction or horror show. Or a police procedural, for that matter. Everything about the show is more ordinary, which may have to do with levels of inventiveness but also feels like a choice.” — New York Times. ➢➢ “Like all great regeneration episodes, there’s some confusion, as the Doctor figures out who she is in her new body. There are new companions, a new monster and perhaps the series’ best action set piece to date. Like the 12 who came before her, Whittaker’s 13th Doctor is her own character, with hints of the past personalities. This Doctor is playful and caring. She is daring and hopeful, but also very weird.” — USA Today. ➢➢ “The look of Doctor Who has taken on a more cinematic edge. The production team say they are conscious that they are making the show in the Netflix age, where people are used to watching lavishly expensive movies and TV shows across all their devices, without necessarily appreciating the huge gap in budget that a British domestic terrestrial TV production is afforded compared to series like Game of Thrones or Black Mirror.” — The Guardian. To think on Monday morning I can get up and watch a new episode of Doctor Who, I’m so darn excited, is anyone else excited? Well, Trevor, it’s about time that we are getting proper TV, so let’s keep up with this trend, don’t you think? I watched Dr Who. I actually quite liked it. I liked the speed it was released following its UK launch. I liked the fact it was in HD. I didn’t like the adverts, they just interrupt the flow. I also liked reading an article alleging Netflix was now more popular with Kiwis than Sky – definitely food for thought, people choosing quality and convenience over “a dinosaur” … Now, if only TVNZ would fast track the latest season of The Apprentice, I quite like watching Lord Sugar grilling the candidates, with the inevitable “Your Fired!” Ha-ha! Hi Phil. Would be interesting to hear any audience figures who viewed online, say this week before the Friday night “launch”? How hungry are the audience here for quality HD viewing fast-tracked and shown on demand? I also noticed the Episode 1 of Season 9 of The Walking Dead was also up on TVNZ way before the time it was shown via Freeview too!